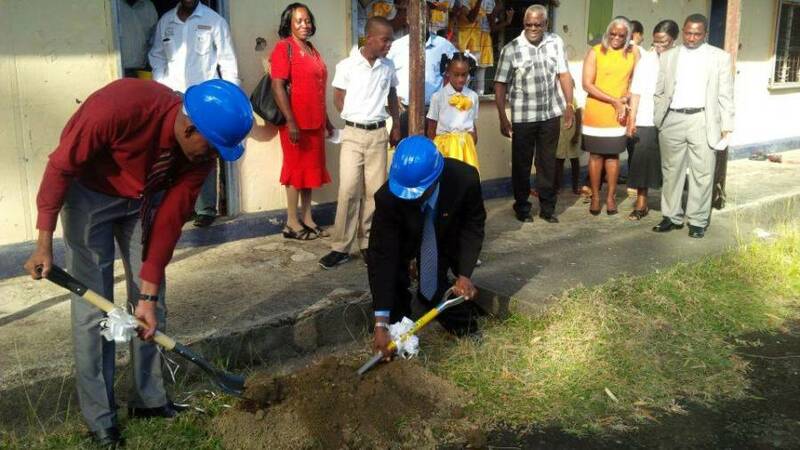 On Monday, 16 February 2015, the Ministry of Education and Human Resource Development held a Sod Turning Ceremony at the Woburn Methodist School, in St George, to mark the commencement of the rehabilitation of that school which is currently not in use. Hon. Anthony Boatswain, Minister for Education and Human Resource Development and Permanent Secretary, Ms Ruth Elizabeth Rouse, among other Ministry officials, joined together with the Principal, Mr Richard Japal, Methodist Church Board, parents, staff and students, of the Woburn Methodist School, to witness the initiation of the project. The project will be carried out at an approximate cost of 4.5 million dollars, through the OPEC Fund for International Development. Once completed the school will also serve as one of the nation’s National Hurricane Shelters. He further stated that this project was in keeping with the government’s strong commitment to facilitate effective delivery of the school’s curriculum, in order to meet global challenges and that government will remain committed to the task of rehabilitating other schools in similar states of disrepair. President of the Woburn Methodist School Parent-Teachers Association, Dr Kecia Lowe, said, “This is a very happy day and a long-awaited one for all of us.” She went on to note that the school is in of the most ideal locations for a school, being a great environment for children to learn, play and grow. During his address, Japal said, “I extend hearty congratulations to everyone who has helped us get this far.” He informed the audience that they were awaiting the rehabilitation of the school for ten years. Work commenced on the project on Wednesday, 18 February 2015 and with an estimated completion date of January 2016.